This recipe is super easy and super flavorful! It’s not necessarily an Asian recipe but adding the hoisin sauce gives the recipe something different than the same ‘ole barbecue sauce or a dry rub! Let’s face it, after a long day of working and chasing kids, the last thing you want to do is spend 30 minutes prepping a meal and another 30 - 45 minutes cooking it and serving it! Ain’t nobody got time for that! With this recipe all you need to do is prep the veggies toss them on the pan, lay the pork on top, cover the pork with hoisin sauce, and bake! A simple and quick healthy recipe! In a large bowl, combine green beans with 1 tablespoon of olive oil, salt and pepper to taste. Lay green beans in the center of baking sheet. In the same bowl, toss potatoes with remaining olive oil, salt and pepper. Add to the baking sheet cut side down and arrange them on either side of the green beans. Lay tenderloin over the green beans and brush with hoisin sauce, salt and pepper. Roast for 20 to 25 minutes, the internal temp of the tenderloins should be 140 degrees. While the tenderloin is roasting, combine chives, garlic, salt and pepper in bowl. When tenderloin is done cooking, sprinkle the mixture over everything and let pork tenderloin rest before slicing. 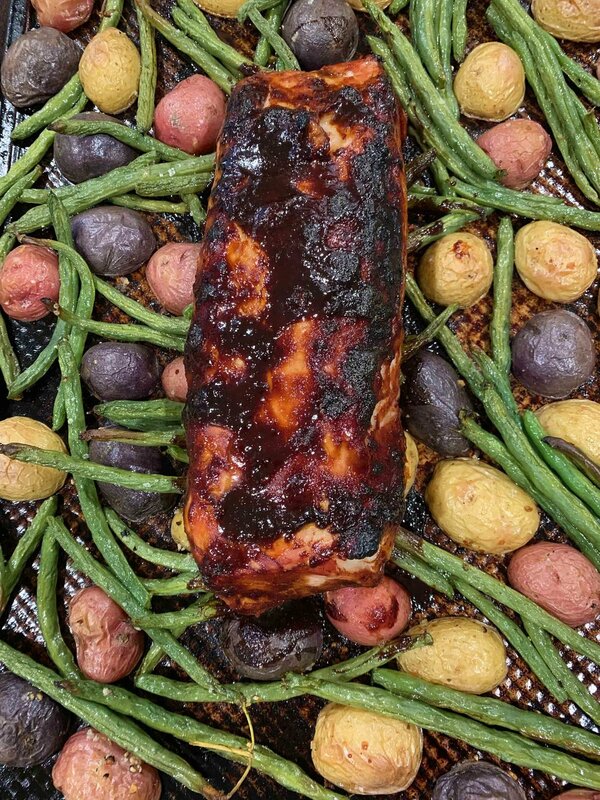 Slice pork and serve with the green beans and potatoes.